Washington tells main Syrian rebel factions they should not expect military support to help them resist government offensive. Washington has told the main Syrian rebel factions they should not expect military support to help them resist a major government offensive to regain opposition-held parts of southern Syria bordering Jordan and the Golan Heights, Reuters reported Saturday. 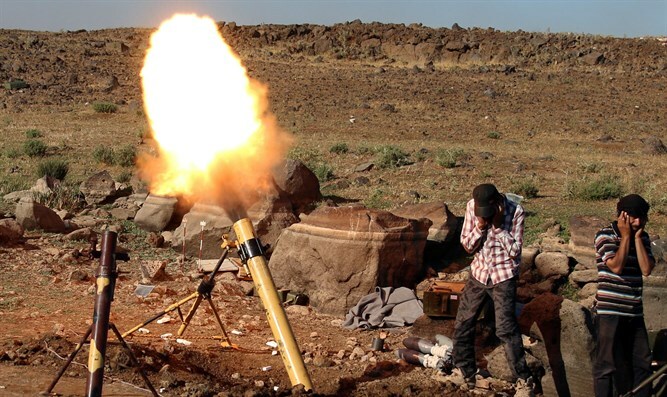 Those statements coming from the administration had raised the hopes of the Western-backed opposition of a possible American military intervention in the event the Syrian army’s bombing campaign broadens to an all-out offensive across the southwest. The U.S. message also told the rebels it was left to them alone to take the right decision on how to face the Syrian army’s military campaign based on what they saw was best for themselves and their people. “We in the United States government understand the difficult conditions you are facing and still advise the Russians and the Syrian regime not to undertake a military measure that violates the zone,” the message also said, according to Reuters. Considered the "moderate" rebel group, the Western-backed FSA was once the country's strongest armed opposition force but is now increasingly marginalized by Islamists. It has been weakened by internal rifts and by competition from other rebel coalitions such as the Islamic Front, a powerful alliance formed last year that is now the largest rebel force with tens of thousands of fighters. The FSA has also been attacked by its jihadist rivals who, after splitting off from the “moderate” opposition, declared Aleppo to be an independent Islamist state and have summarily executed members of the Western-backed rebel groups. Washington in the past supported the FSA with arms and salaries in the course of the seven-year war under a military aid program run by the CIA. Analysts believe the aid has dropped after U.S. President Donald Trump decided last year to shut down the program. Trump has also expressed his desire to withdraw American troops from Syria altogether, having said in March the U.S. would be out of Syria "very soon". The White House, however, insisted that Trump still wants U.S. forces in Syria to return home as soon as possible.